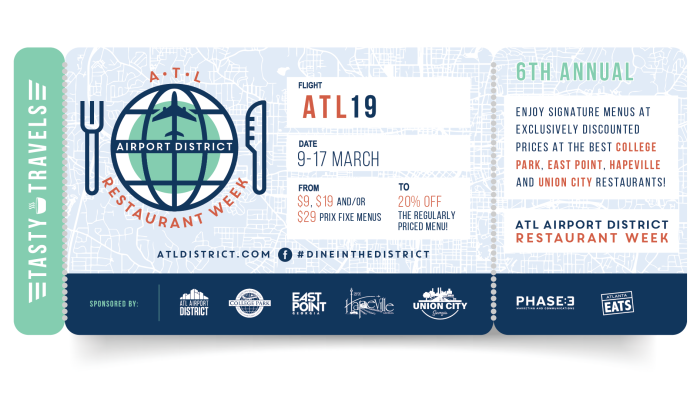 The ATL Airport District has kicked off its sixth annual ATL Airport District Restaurant Week which runs through Sunday, March 17. During this nine-day culinary celebration, patrons are invited to enjoy dining deals at top restaurants throughout the district, which includes the cities of College Park, East Point, Hapeville and Union City. Attendees will be able to dine at a wide selection of local favorites, ranging from classic Southern fare to contemporary restaurants with a twist. Featured restaurants throughout the district are now offering $9, $19 or $29 prix fixe menus or signature dishes at a 20 percent discount. All menu prices will be valid for brunch, lunch or dinner and exclude alcohol, tax and gratuity. For a full list of participating restaurants, visit www.ATLdistrict.com. Hungry? Hapeville has you covered. Start your food adventures in the Atlanta Airport District off right with a beer, cider or mead at Beer Girl There are about 35 brews on tap to please any palate, ranging from light and refreshing to rich and dark and everything in between. Pick up a growler of your favorite beer on tap or buy bottles, cans and more of hard-to-find brews that won’t be located in the nearest grocery store. Think classic Cuban fare in a homey setting and you’ve got Mami’s La Cubana. The empanadas are outstanding; hearty and richly seasoned chicken or beef are classic and the vegetarian cream cheese and papaya are equally decedent and delicious. Along with tostones, steak sandwiches and more, Mami’s La Cubana is a taste of authenticity. This barbeque joint is a classic – serving up any sort of pit-smoked meat you can imagine. If you believe that a line out the door of a restaurant is a sign that the place is popular and delicious, you’ve found the right spot at Pit Boss BBQ. While the brisket and pulled pork are traditionally tasty, be a little more adventurous and order the smoked chicken wings and homemade, perfectly seasoned pork skins that are as big as your head. You won’t be sorry once these smoky and savory appetizers hit the table. Did you know that the Porsche Experience Center is home to an upscale restaurant? Patrons can nosh on elegantly crafted cocktails, bites like seared octopus and spicy lamb, and a plethora of whimsical and delightful desserts surrounded by views of the Porsche test track. Restaurant 356 offers a truly unique experience, along with exceptional food, that cannot be found elsewhere. With a wide variety on the menu, plus pool, trivia and other games and entertainment, The Corner Tavern is a great place to chow down and have fun. If you like spicy food, go for the Jive Turkey Burger which is juicy and delicious with a kick thanks to the intense Sriracha Ranch. Cool down with beer from Hapeville’s own Arches Brewing or a cocktail like the Bourbon Cowboy which combines Redemption Rye and Old Smokey Root Beer whiskies with bitters, fresh nutmeg and orange.